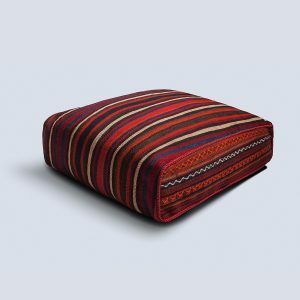 Timeless kilim floor cushion designs. Choose your favourite style & size. Your home is a reflection of your personality and style. It speaks to guests, who you are and what you like. When you’re entertaining or just hanging out with your family, stay stylishly comfortable with our decorative floor cushions. If your look is a fusion of vintage boho, you’ll go cushion crazy for our handmade pieces. Every cushion cover is one-of-a-kind, as we create beautiful kilim designs from material we buy in the market. Whether it’s a soft mustard floor cushion to make the ‘centre’ of the room or you’re after something more subtle, like a simple black and white style, you’ll find it at Lotus Handicraft. Natural, hand-woven kilim floor cushions, from Lotus Handicrafts. 12-month warranty on all cushions. You might be in your favourite Home Art Magazine. Think about how much your floor cushions go through. We rest our heads on them, as well as our dinner plates and laptops. When you’re taking a nap on the couch, you want to know that cushion material isn’t agitating your skin. 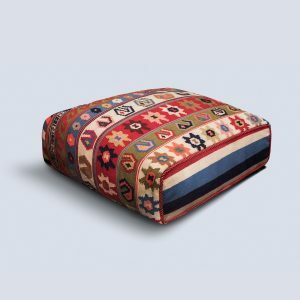 We have two sides to our cushions: one is made of kilim, the other is soft fabric. Sink into the softness. We know the entire history behind your product because we made it, from the very first sew of kilim. If you’re hunting for unique art to decorate your home, start simple with floor cushions. Don’t wait until your next exotic trip to find that ‘OMG I love it’ piece. Save space in your suitcase and get it straight from us – an Australian company, meeting with kilim artists in Iran.